← 462 "Moe Letter Blues"
"The sum total is the greatest murder since Snape killed Dumbledore!" Harold from Harold and the Purple Crayon draws the Simpsons' living room, as well as a can of Duff for Homer. Batman is not "nothing without his utility belt." "The Bob Next Door" is the four hundred and sixty third episode of The Simpsons and the twenty-second of the twenty-first season. 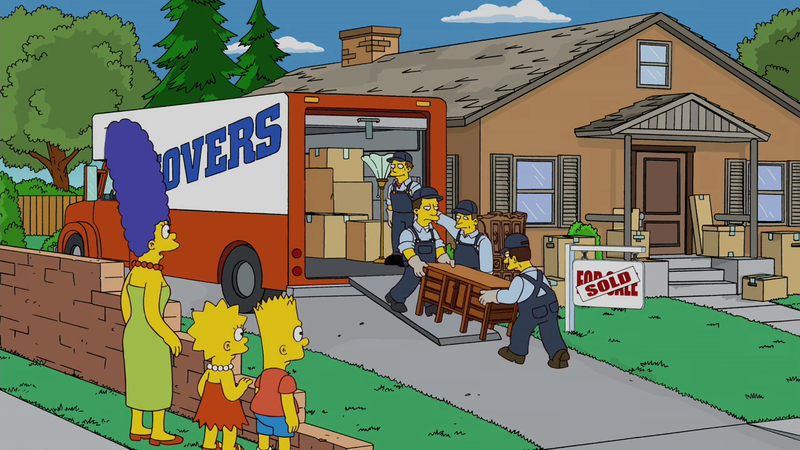 The Simpsons watch their new neighbor move in. At an emergency town-hall meeting, Mayor Quimby announces to Springfield's citizens that the town is suffering from an economic crisis. Therefore, he decides to enact several cost-cutting measures, one of which includes the release of all prisoners convicted of minor offenses from Springfield Penitentiary. Many Springfieldians move because of the crisis, including The Simpsons' neighbors, mother and daughter Ruth and Laura Powers and their home is put on the market. Homer, after smelling cookies baked by realtor Cookie Kwan to attract buyers, decides he wants to purchase the house. Just as Homer is filling out loan paperwork, Cookie informs him that someone has already bought the property. Shortly after, Marge, Lisa and Bart watch several movers carrying personal possessions into the house. They conclude that their new neighbor is a lover of hybrid cars, antique furniture, and koi ponds. Just then, the new neighbor — Walt Warren — arrives and Bart heads over to introduce himself, "Bart Simpson-style". Bart spits on his hand and holds it out to shake in a playful prank. Walt greets him with a eerily familiar "Hello, Bart." Bart immediately recognizes Walt's voice as that of Sideshow Bob's and runs off screaming in terror. Bart begins barricading himself into his home, all the while trying to convince the rest of the family that Sideshow Bob is living next door, using the identity of Walt Warren as a distraction. Homer and Marge attempt to reassure him that "a lot of people sound like Sideshow Bob, like Frasier on Cheers, Frasier on Frasier, and Lt. Commander Tom Dodge on Down Periscope" but Bart remains unconvinced. He decides to unmask Walt as Bob and reveal to everyone the truth. 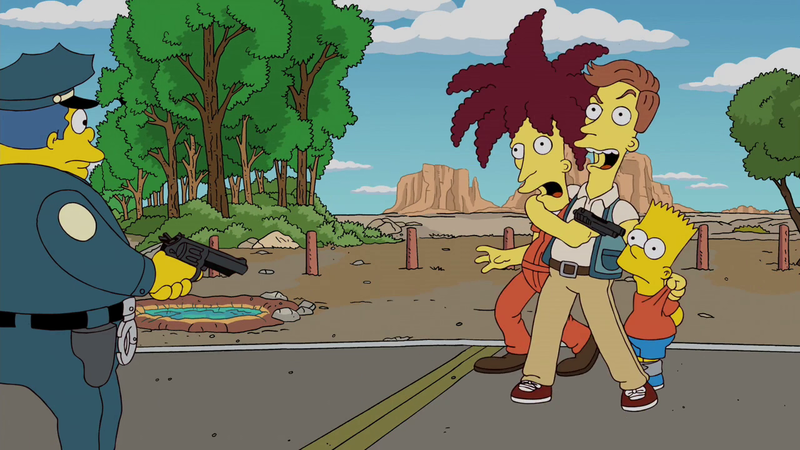 Bart suspects Sideshow Bob is at it again. Joined by Milhouse in his treehouse, Bart attempts to trick Bob into exposing his identity by singing loudly to a Gilbert & Sullivan operetta, knowing that his nemesis, who has a fondness for such music, would overhear and be unable to resist joining in. Their plan fails, however, when Walt expresses his distaste for opera and instead declares his love for country. Later, at a neighborhood party, while Walt is giving a speech to a group of Springfieldians, Bart sneaks into Walt's home, to try and locate any proof. He searches through cupboards, drawers and a stack of magazines, but fails to find any solid confirmation that Walt is indeed Bob. He ultimately ends up getting caught by Marge. In order to put an end to Bart's paranoia, Marge decides to take him to Springfield Penitentiary to prove that Bob remains incarcerated. A guard leads them to Bob's padded cell, where Bart's nemesis is preoccupied with scrawling "Bart Simpson will die" all over the walls. Once Bob spots Bart looking at him through the vision panel, he jumps towards the cell door and mumbles something, before the guard intervenes. Marge and Bart leave, now convinced that Walt cannot be Bob. That night, Bob launches an escape plan. Attracting the attention of a guard, Bob manages to wrestle the guard's taser off him, stunning him and escaping outdoors. After avoiding capture by prison hounds (one of which mistakes Bob's hair for a bush and urinates on him), he makes it over the wall and escapes. He heads for Evergreen Terrace. The next morning, Walt invites Bart to a Springfield Isotopes baseball game. Bart accepts the invitation and shortly after, the pair begin their journey to the Springfield Stadium. Meanwhile, Sideshow Bob arrives at the Simpsons' home and shocks Marge and Homer, the latter who holds Bob captive. Bob explains that he isn't actually Sideshow Bob, he's the real Walt Warren. "If you're the real Walt Warren," Marge questions, "Then who's taking our son to the baseball game right now?" Concurrently, 'Walt' doesn't take the freeway turn-off to the stadium and Bart suspects that something is up. "You don't have to call me Mr. Warren anymore," 'Walt' says slyly, "See Bart, you were right all along...I am Sideshow Bob!" Bob shows his true self by taking off his shoes, subsequently unfolding his unusually long feet - undeniable proof that he is Bob. "And now I am free to sing all the Gilbert & Sullivan I damn well please!" Bob remarks, as Bart watches on unnerved. Back at the Simpson house, Homer and Marge release Walt and head over to Bob's house, where, in his bedroom, they discover dozens of pictures of Bart with knives in them, effigies of Bart being hanged and drowned in an aquarium, and so on. Lisa also finds a brochure for Five Corners, the only point in the U.S.A. where five states meet, with the notation "KILL BART HERE" handwritten in red. The Simpsons and Walt set off for Five Corners. Meanwhile, Bob recounts his escape from prison to Bart. He explains that his cell-mate, Walt, a minor offender, who fortuitously had the same build and facial structure as him, was up for early release. Shortly before his release took place, Bob performed plastic surgery on Walt and switched their faces, before simply walking out posing as Walt when he was set free. He then used the proceeds from Walt's investments to buy the house next door to the Simpsons. Later, Bob stops at a diner for food, where a waitress (mistaking a suture for a jacket thread) accidentally pulls his face off. Bob dashes back into his car and continues his journey with Bart to Five Corners. Soon after, the Simpsons and Walt arrive. The unsettled waitress sends the Simpsons to Mexico, while Walt, sensing that she fell in love with his face and is purposefully sending them on the wrong route, carries on for Five Corners. Bob and Bart arrive at The Five Corners. 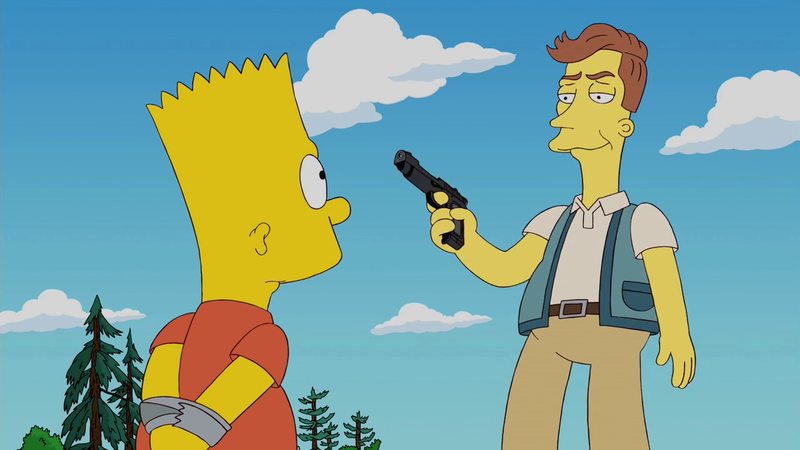 He informs Bart that he will stand in one state; reach into a second state and shoot his gun; have the bullet travel through a third state; hit Bart in a fourth state; and Bart will fall dead in the fifth state. No single portion of the sequence is illegal, therefore none of the five states will be able to prosecute him for Bart's murder. Just as Bob is about to put his plan into action, Walt arrives and wrestles the gun away. Suddenly, a bee appears under Bob's transplanted face, which distracts Walt - Bob takes the gun back and is seconds away from shooting both Walt and Bart, before Chief Wiggum arrives with Eddie and Lou. The law enforcement officials from the other four states quickly make an appearance, cutting off Bob's escape. Bob is arrested by the New Jersey cops and taken away. Back at Evergreen Terrace, Walt's former house is now vacant, but only temporarily. A distant Flanders relative called Ted Flanders moves into the house, and he and Ned start a conversation laced with "Flanders-isms", talking to each other from across the Simpsons' front yard. Homer goes stir-crazy. "The Bob Next Door" was written by long-term writer John Frink and directed by Nancy Kruse. 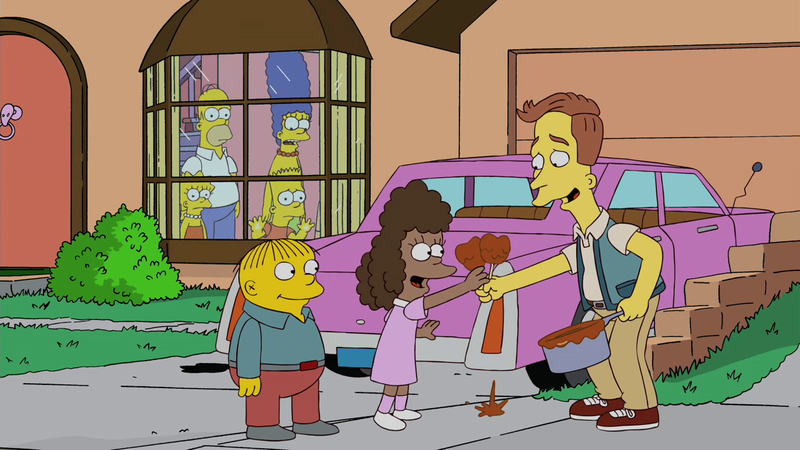 According to executive producer Al Jean, "The Bob Next Door" was slated to air on January 14, 2010, along with "Once Upon a Time in Springfield" and "The Simpsons 20th Anniversary Special in 3-D on Ice", but was instead moved to May 16 for an unknown reason. The episode was watched by an estimated total of 6.25 million viewers and received a 2.1 in the key demographic, losing out to Family Guy. Critically, "The Bob Next Door" received very positive reviews. 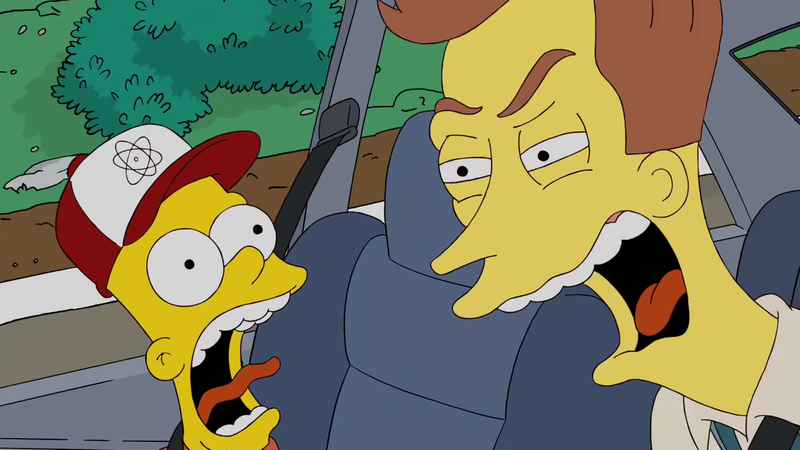 IGN described the episode as "a funny return to form that proved there's still a lot to enjoy when The Simpsons pit Bob and Bart against each other." They ultimately gave "The Bob Next Door" a 8.5/10 rating, adding that the episode "reminded us what makes Bob so much fun." The A.V Club called it "refreshing" and "a fine half-hour of entertainment." 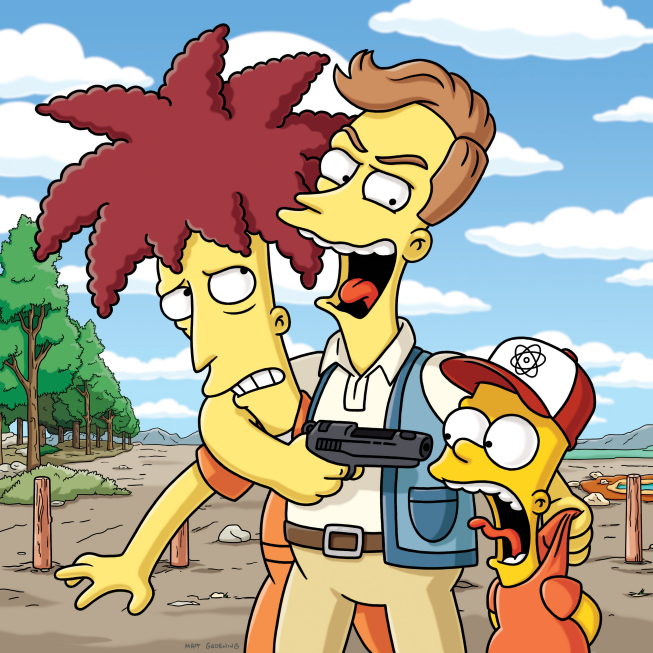 They compared the episode's final moments to previous Sideshow Bob episode "Cape Feare" and concluded, "If The Simpsons intends to self-plagiarize (and it obviously does), that’s a good episode to copy." They ultimately awarded the episode a B+ grade. The TV Critic also gave positive opinion. They wrote that "The Bob Next Door" was better than recent Sideshow Bob stories "owing to the Face/Off elements which added a new twist on Bob's escape and murder attempts. "TV Fanatic gave the episode a 4/5 star rating, and complimented its "strong plot line" and "good twists." Fan reaction was also positive. 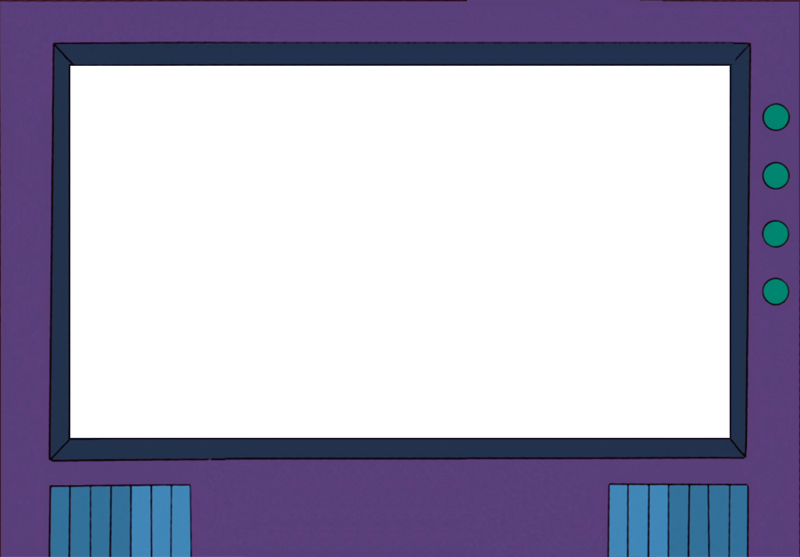 On The No Homers Club, a fan poll had a majority 4/5 rating, with many commenting that the episode was better than previous Sideshow Bob episodes, notably "Funeral for a Fiend" and "The Italian Bob." Fans complimented the final showdown at Five Corners, which was described as "inspired", but many were critical of Bob switching faces with Walt labeling it as "a bit too far fetched." The episode currently has a 7.4/10 IMDb rating and a 8.7/10 rating on TV.com. Wikisimpsons has a collection of images related to "The Bob Next Door". ↑ IGN - The Simpsons Say Hello to Season 21 - "Executive Producer Al Jean tells us what's to come this season." ↑ TVbytheNumbers - "TV Ratings: Survivor Finale Tops ABC's Finale Sunday, Celebrity Apprentice Ties Series Low"
↑ A.V Club - FOX Animation - "The Bob Next Door"/"Cleveland's Angels"/"The Splendid Source"/"Great Space Roaster"
↑ TVFanatic.com: The Simpsons Review: "The Bob Next Door"
Modified on July 16, 2016, at 09:38.